Definition: The electrical substation is the part of a power system in which the voltage is transformed from high to low or low to high for transmission, distribution, transformation and switching. The power transformer, circuit breaker, bus-bar, insulator, lightning arrester are the main components of an electrical substation. Outgoing feeder for feeding the other subsequent substations or switchgear. Voltage transformer connection for control and metering. The circuit breaker is connected between the bus-bar and each incoming and outgoing circuit. The isolator is provided on each side of the circuit breaker. The current transformer is used for measurement and protection. The current transformers are placed on both sides of circuit breaker so that the protection zone are overlapped and cover the circuit breaker. The potential transformer is connected to the bus bar and on the incoming line side. Lightning or surge arrester are connected phase to ground at the incoming line as the first apparatus and also at the terminal of transformer and capacitor bank, the terminal of shunt reactor and a terminal of the generator, the terminal of the large motor to divert switching. The following factor is considered while making site selection for a substation. 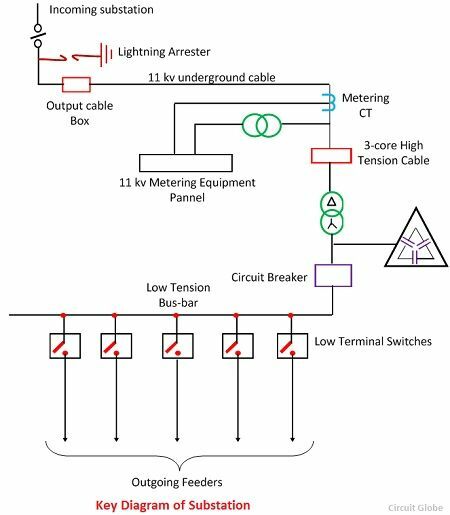 Type of substation – The category of the substation is important for its location. For example, a step-up transformer is a point where power from various sources is pooled and step up for long distance transmission should be located as cool as possible to minimise the losses. Similarly, the step-down transformer should be located nearer to the load centre to reduce transmission losses, the cost of the distribution system and better reliability of supply. Availability of suitable and sufficient land – The land selected for a substation should be level and open from all sides. It should not be waterlogged particularly in the rainy season. The site selected for substation should be such that approach of transmission lines and their take off can be easily possible without any obstruction.The places nearer to airdrome, shooting practice ground, etc. should be avoided. Communication facility – Suitable communication facility is desirable at a proposed station, both during and after its construction. It is better, therefore, to select the site alongside the existing road to facilitate an easier and cheaper transportation. Atmospheric Pollution – The atmosphere around the ground factories produces metal corroding gas, air fumes, conductive dust, etc. And the area near the sea coast may be more humid and is harmful to the proper running of the power system. Thus, the substation should not be located near the factories or sea coast. Availability of Essential Facilities to the Staff – The site should be such where staff can be provided essential facilities like school, hospital, drinking water, housing, etc.